When the Baltimore Ravens reached Super Bowl XXXV at Raymond James Stadium in Tampa Bay, Dave Wohlfort was there. He just wasn’t inside the stadium. Wohlfort, a 1980 graduate of Calvert Hall College High School, roamed the perimeter of the stadium on Jan. 28, 2001, with a friend, searching for someone willing to part with a pair of tickets. Unsuccessful, they spent the majority of the game in a Tampa bar, watching the Ravens beat the New York Giants, 34-7. Ten seasons later, Wohlfort hopes he will be inside Cowboys Stadium in Dallas for next February’s Super Bowl XLV, to actually witness a Ravens’ championship. “I would go to the Super Bowl in a second, but I would not go if I didn’t have a ticket in hand,” he said with a laugh. Hopes are high as the National Football League season starts. The Ravens visit the New York Jets for Monday Night Football Sept. 13, with many analysts picking the team to be a Super Bowl contender. An offense with Anquan Boldin, Joe Flacco and Ray Rice has people buzzing. Around the Archdiocese of Baltimore, fans of other teams hold out similar hope, that their team can get to the Super Bowl. The Washington Redskins have a large following in Anne Arundel, Frederick and Howard Counties, and parts of Western Maryland, which also counts a larger Pittsburgh Steelers fan base. 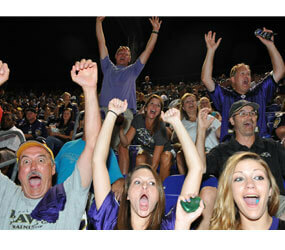 Father James D. Proffitt, pastor of Severna Park’s St. John the Evangelist, is a Ravens fan. He teases opposing fans, at Mass and in his blog. Even his Facebook status, about visiting the parish’s school, stirred a Redskins-Ravens debate. If a young person wears a Steelers jacket to Mass, he might come in for a bit of taunting. Wohlfort and his two brothers, Phil and Bob, have been season-ticket holders since the Ravens arrived in 1996. Phil is a member of the Calvert Hall class of 1976, while Bob graduated in 1978. Phil wears the ring of the class of 1938, which included their father, Henry. After the Ravens lost to the Indianapolis Colts in the playoffs last January, Dave Wohlfort’s passion didn’t subside. He devoured team news. Tailgating is a major deal for the Wohlforts and friends. For 1 p.m. kickoffs, they arrive at parking lots at 8 a.m., and enjoy elaborate meals. Football has brought the Wohlforts together. Back in Severna Park, Father Proffitt has little time to watch games. Masses on Sunday mornings and afternoons dot his schedule. Monday night meetings might conflict with this season’s opener, but he watches and enjoys when he can. When not in clerics, he’ll wear a Ravens jersey. He’s got a Ravens gnome, a purple scarf and high hopes for the 2010 season.